The study revealed a Saudi-Emirati rivalry in Yemen that has weakened the Yemeni legitimacy and government in liberated areas and given the Houthis an opportunity to strengthen their influence in other areas they control. 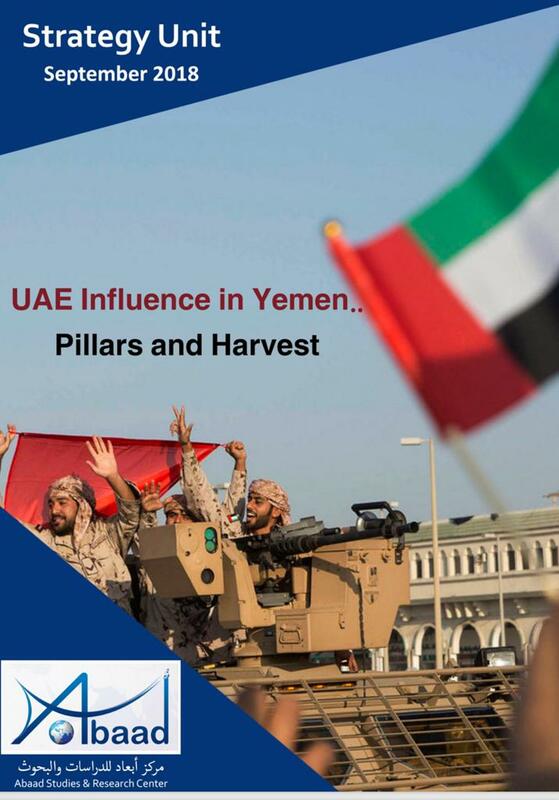 The study of "UAE Influence in Yemen: Pillars and Harvest," published by the Abaad Center for Studies and Researches, presents a vision on the role of the UAE in Yemen under the cover of the Arab Coalition, which declared a military operation in Yemen under the name of the Decisive Storm in March 2015 after forces loyal to former president Ali Saleh and the Houthi militias carried out a coup against the government of President Abd Rabbo Mansour Hadi. The UAE role developed amid several local, regional and international transformations. The study points out that the role of the UAE in Yemen has deviated significantly from the main goal of the Decisive Storm towards the overthrow of the legitimate government, casting doubt in the legitimacy of President Hadi, the formation of militias and supporting armed rebellions against the government, as happened in January 2018 in Aden. According to the study, as the UAE "used the umbrella of the Arab Coalition, led by Saudi Arabia, to expand in the south and take control the ports and airports, it also used the fight against terrorism for hegemony and expanding its control to include new governorates and regions." The study revealed that the UAE is marketing itself as a country that counters terrorism and the Iranian-backed Houthis to achieve its own strategic goals that include a long-term military and investment presence in Yemen, particularly in Socotra and Bab al-Mandab, and the controlling of Yemen's oil, gas, ports and airports as well as monopolizing the sectors of internet, telecommunications and power. The study identified the pillars and tools of the UAE in Yemen, including the political and military force, such as the Southern Transition Council, which was established after the removal of UAE allies from their positions in May 2017, to ensure its control of the street movement that demands secession, and the formation of militias outside state military institutions (the security belt and the elite forces) in several governorates, allies of the General People’s Congress, the party of former president Ali Abdullah Saleh, in addition to Emirati and multinational forces in Yemen within the so-called UAE National Guard forces, which receive orders from the Crown Prince of Abu Dhabi Sheikh Mohammed bin Zayed. Regarding the deviation of the role of the UAE, the study has given an example the torture of prisoners in UAE-run prisons in Aden and the targeting of citizens and arbitrary arrests by forces and militias supported and financed by the UAE on the basis of their opposition political views against the UAE role in Yemen. The study provides an explanation of the pillars of the Emirati influence in Yemen, which allows UAE a degree of dominance and intrusion performance. On the top of those pillars is the umbrella of the Saudi-led Arab Coalition and the existence of some local forces that are compatible with the UAE role and adopt projects that are against the legitimacy of President Hadi and the federal state project, which came out from the National Dialogue Conference. The study presented four possibilities for the ambiguity of the Saudi position towards the intervention role of the UAE in Yemen, including the possibility of understandings between the Saudi and UAE leaderships, the possibility that Saudi is busy with internal arrangements and defending its southern borders, and the possibility of Saudi need for the UAE influence in the positions of the American administration. The last possibility is that UAE has an influence in the Saudi internal decision and Saudi foreign positions. The conclusion of the study refers to the harvest of the UAE presence in Yemen. It concludes that as long as the Houthi rebellion exhausted the state institutions in the north, the UAE-supported Southern Transitional Council in the south and the formation of pro-UAE militias outside the Yemeni Army to achieve UAE own objectives, weakened the legitimacy of President Abd Rabbo Mansour Hadi. The study confirms that the presence of the UAE and the activation of its tools caused the disintegration of the legitimate government to the extent that the government became doubtful to manage the southern governorates.